Tapit struck again at the Aug. 10 session of the Fasig-Tipton Saratoga selected yearling sale when one of his colts brought $2 million. The colt, out of the Galileo mare Dress Rehearsal, was purchased by El Capi Racing, a partnership based in Miami and whose five members all hail from South America. Four Star Sales, agent, consigned the colt on behalf of his breeder, Ben Sangster of Swettenham Stud. He was Hip 70 and the second seven-figure Tapit yearling to sell on opening night of the two-session auction in Saratoga Springs, N.Y.
Francisco Convit manages the partnership that includes brothers Carlos Uzcategui and Jose Uzcategui, who attended the sale and all erupted in celebration when the hammer feel. Both Convit and Carlos Uzcategui said they were not surprised at the final price, which they had expected to approach $2 million. They bought the colt to race but said they had not decided who may eventually train the horse for them. “We are definitely going to race him; we’re going for the glory,” said Carlos Uzcategui. 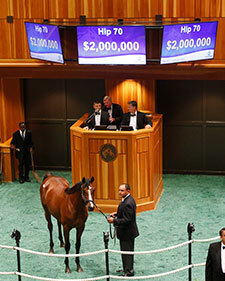 Four Star Sales sold a full brother to the session-topping colt two years ago, who is stakes-placed Christophermarlowe. “This colt is a different type than his brother with more appeal to the American market,” said Kerry Cauthen, managing partner of Four Star Sales. Earlier in the sale a Tapit colt, Hip 34, sold for $1.2 million.